The baby is sleeping…so I can squeeze in a quick post. I wanted to show you what I ate for lunch today, it took less than 5 minutes to prepare and it was delicious and healthy! On the side I had cole slaw that I made for dinner last night using this recipe – I highly recommend it! I made a few changes – I omitted the onions and peppers (didn’t have any) and used less oil and sugar. I also enjoyed an organic peach from my CSA. Actually a lot of the food was from my CSA: romaine lettuce, cabbage and the peach! 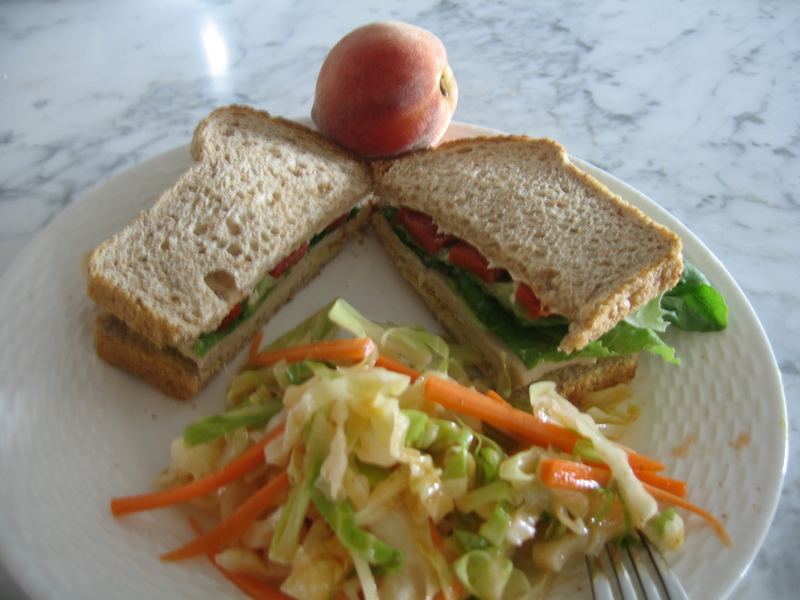 I love this meal because it’s high in fiber (whole wheat bread, lettuce, peppers, cabbage, and the peach) and high in protein (turkey). It’s full of color which means it contains a wide variety of nutrients and will keep me full do the combination of protein and fiber! Add in deliciousness and it’s a winning combo! If I can make a healthy lunch in minutes with a screaming baby in my arm – you can too! I wrapped paper towl around the base of the lettuce heads to keep them fresh, then stored in the plastic bag in the refrigerator. I kept the potatoes out, you should not refrigerate potatoes (the refrigerator turns the starch to sugar). Corn should be eaten quickly, since it tastes the best but if you’re not going to then keep them in their husks and place in a bag in the fridge. I also stored the onions & apricots in the fridge for later use. With a lot of these vegetables I decided to make a big salad for lunch. I decided to use an ear of corn, I first shucked the corn, and then wrapped it in a damp paper towel, placed on a microwave safe cooking plate and cooked for 3 minutes. This cooks the corn perfectly! I used a knife to take it off the cobb and added it to my salad. This was an incredibly satisfying salad, it hit all the taste buds and included fiber, protein and some fat to keep me full! The chicken sausage is a great protein topping for salad since it’s pre-cooked you just have to heat it up! I like the Bilinski’s brand because they are lower in sodium (this one had ~350 mg per link), and low in fat and calories. For fat, I added avocado (heart-healthy) and a little goat cheese. The salad was very high in fiber between all the raw vegetables, kohlrabi and corn. This was a winner combination! Kohl-what? Most poeple I have spoken to in the past week have never heard of kohlrabi. So you may be asking “what is it?” Kohlrabi is a vegetable in the cabbage family, sometimes referred to as the “German Turnip.” The taste is similar to a broccoli stem, with a crunchy texture and a slight bitter yet sweet taste. The sweetness will intensify if you cook it. Kohlrabi can be eaten raw or cooked. I recently started getting weekly farm deliveries from a local farm, which is a great way to experiment with new recipes and try vegetables you may not have bought on your own. Kohlrabi was something I had no idea what to do with! 1 cup (135 grams) of raw Kohlrabi has 36 calories, 8 grams of carbohydrate, 5 of which are dietary fiber, and 2 grams of protein. It is an excellent source of vitamin C.
I first decided to try kohlrabi raw. I peeled it with a knife, chopped it, and added it in a salad. I was not very impressed with the taste – tasted a bit bitter to me. I decided that I would probably prefer it cooked, and my favorite way to cook vegetables is roasting them, so that’s what I decided to do. I placed the peeled, chopped kohlrabi on a cookie sheet lined with aluminum foil and sprayed with cooking spray. I then tossed it with 1 tsp of olive oil, salt & pepper. I preheated my oven to 400 degrees, placed the kohlrabi in the oven. I turned the kohlrabi over after 15 minutes and let cook for another 15 minutes. After 30 minutes in the oven, they were cooked perfectly. I added them to a salad for lunch and loved them! Roasted kohlrabi becomes sweet, similar to a roasted turnip, the bitter taste completely goes away. I will definitely make roasted kohlrabi again.